In Sedona, the plural of vortex is usually vortexes not vortices. So what is a vortex, anyway? Well, you see them in everyday life. The turbulent flow of water makes vortices. If you have ever seen a whirlpool in a river or watched water going down the drain in the bathtub and have witnessed the tornado-like glassiness of spinning water, you have seen a vortex. A vortex is created from a spiraling motion of air or liquid around a center of rotation. If you have ever witnessed a dust devil kick up in the desert, you have seen a vortex. In Sedona, vortexes are created, not by wind or water, but from spiraling spiritual energy. The vortexes of Sedona are named because they are believed to be spiritual locations where the energy is right to facilitate prayer, meditation, and healing. Vortex sites are believed to be locations having energy flow that exists on multiple dimensions. The energy of the vortexes interacts with a person’s inner self, although that definition can be ambiguous. Over millions of years, layers of sandstone and limestone were left in the Sedona area by a receding ocean. Iron oxide eventually covered the grains of sandstone and, in a natural process, rust formed. The stunningly beautiful red rocks of Sedona are the result of this process. It is within the beauty of the red rocks that the mysteries of the Sedona energy vortexes unfolds. Human history in the Sedona area began about 4000 BC when hunter-gatherers roamed and settled in the Verde Valley and Prescott areas. Between 900 and 1350 AD, a more advanced civilization began building pueblos and cliff houses. Known as the Sinagua (without water) they developed skill in dry farming, had an understanding of astronomy, and made baskets, pottery, and jewelry. They established trade routes with the peoples of the Pacific coast, Mexico, and Central America. Cliff dwellings are still evident today. One of the most beautiful is Montezuma’s Castle, not far from Sedona. As you hike the red rocks, you will see petroglyphs and pictographs left behind by these ancient peoples. The awe-inspiring vistas, along with the magnificent views of the sky, have drawn out the spiritual nature of people from the very beginning. In 1987, Sedona‘s reputation as a spiritual center got quite a boost. Many journeyed to Sedona during the time of the highly anticipated "Harmonic Convergence." On the weekend of August 16 and 17, 1987, the greatly anticipated convergence was supposed to take place as José Arguelles, New Age author and artist, told people. A great many believed him, including prominent leaders of the New Age movement like Shirley MacLaine and also millions of the curious and the intrigued. What was the nature of this convergence? Well, according to Arguelles, at this time the Earth would start slipping out of its "time beam" and risk spinning off into space—only by the concerted, psychic efforts of the human race would it remain in place. This time would see a great increase in the experience of deja vu and UFO sightings. However, if enough people would simply gather at sacred places around the globe and concentrate enough, the New Age would begin, the Earth would remain safe, and a new era of harmony and love would be inaugurated—or so they believed. Sedona was a sacred place, so why not gather there, people thought. Ultimately, the earth did not slip away and spin into space. So did this convergence of people in Sedona have any effect on that outcome? This remains part of the mystery. A wonderful account of a recently graduated massage therapist attending an Arizona conference is not unlike those that journey to Sedona for the first time. In an article titled, A Sedona Arizona Spiritual Quest, he recounts, “My spiritual quest to Sedona was due to the fact that some of the world's energy vortexes are located here. These vortexes are subtle energy centers where spiritual and psychic powers are enhanced. To say I was a little curious was an understatement. My hotel room window afforded me an unobstructed panorama of one of these energy vortexes known as Bell Rock. That would be my first hike in my quest.” He then goes on to tell about his hike with the first taste of spirituality—being "needled" by an Arizona cactus! Cathedral Rock Vortex at Red Rock Crossing - Take Hwy 89A southwest out of Sedona (toward Cottonwood). At the top of the hill (after the Verde Valley Medical Center) make a left (Upper Red Rock Loop Rd.) Go down the hill (1-2 miles). At the bottom of the hill, make a left and follow the signs for Red Rock Crossing/Crescent Moon Recreational Area. From the day-use parking lot, walk along the creekside trail 1/4 to 1/2 mile to the Red Rock Beach area. ($10 per car charge). There are alternative ways to get to this vortex area but Red Rock Crossing is one of the most photographed. Boynton Canyon and Long Canyon Mesa Vortexes - Boynton Canyon is considered by some to be the most powerful of the vortexes in Sedona. It is a scenic box canyon. Take Hwy 89A southwest toward Cottonwood. At the theaters, make a right on Dry Creek Rd. Drive three to four miles to the "T." For Boynton Canyon turn left at the "T" and follow signs to the Boynton Canyon Trail. The small parking area will be on your right. For Long Canyon turn right at the "T." When the paved road ends, follow the dirt road to the left (200 yards) to a small parking area. Walk up the steep hill. At the top of the hill go left. When the road next forks, go right. Follow the road to a knoll. Oak Creek Canyon Overlook Vortex - Take Hwy 89A north toward Flagstaff. At the top of the switchbacks (15 to 17 miles from Sedona) look for the entrance to the overlook on the right. Park and walk the short distance out to the vista point. Chapel of the Holy Cross Vortex - Drive down 89A. After the Poco Diablo Resort, look for signs for the Chapel. Follow the signs and make a left on Chapel Road. The road ends at the Chapel parking area. Walk to the sitting rocks or benches. The Chapel of the Holy Cross has limited hours. West Fork of Oak Creek - Energy Well Spring - Take Highway 89A 11 miles north of Sedona (toward Flagstaff). One mile past Oak Creek Cabins, look for the entrance to the parking lot at the big sweeping curve to the right. At the southwest corner of the parking lot follow the trail along the creek to the metal sign at the creek crossing point. Once you are up on the opposite bank, walk south to the ivy glen and turn right. Follow the trail 1/4 mile until you come to the West Fork Creek. Once you cross this smaller stream you are at the official beginning of West Fork. The mostly level trail starts there. Wear old shoes or Gortex boots as the trail repeatedly takes you through the creek. Use a walking stick for balance when crossing the creek. Taking a Vortex Tour is ideal as some of the vortexes are not easy to find. Here are some of the people who can take you on a tour of the Sedona Vortexes. Pink Jeep Tours offers a "Touch the Earth" off-road tour for those that have a special interest in learning about and finding vortexes. Earth Wisdom Tours has experiential jeep tours, hikes, Indian ruins, and sacred site (vortex) tours through the beautiful Red Rocks of Sedona, Arizona. They tout that they are, "the only Sedona tour company to have permits for all of the famous vortex sites in Sedona." Sedona Vortex Tours are gifted in the healing arts, something to keep in mind as you plan your retreat or tour. They would love to take you out on a vortex tour or do a Medicine Wheel ceremony with you. There are several options depending on your needs as you explore the spiritual side of Sedona. Pete A. Sanders, Jr. gives a preparatory "vortex briefing" on his Vortex Tours and Lectures. You can attend the lecture at Los Abrigados Resort without participating in his tours. The charge for the lecture is $15. Tour participants travel to two of Sedona's vortex areas. Mr. Sanders is a fully permitted hiking guide. As such he can lead tour participants (in their own vehicles) to designated parking places and hike with them to selected meditation sites. Participants are instructed in how to best tap the two locations for the contemplation, problem-solving, or spiritual skills that they are most interested in. Arizona Safari Jeep Tours are great if you want to get out of town, visit a couple of vortex sites, learn something about vortexes and know you won't be expected to become an instant "believer." The tour is laid back, really isn't too much off-road, yet takes you to beautiful sites such as Red Rock Crossing, a very powerful vortex site. Visit Sedona lists additional tours with a spiritual focus. 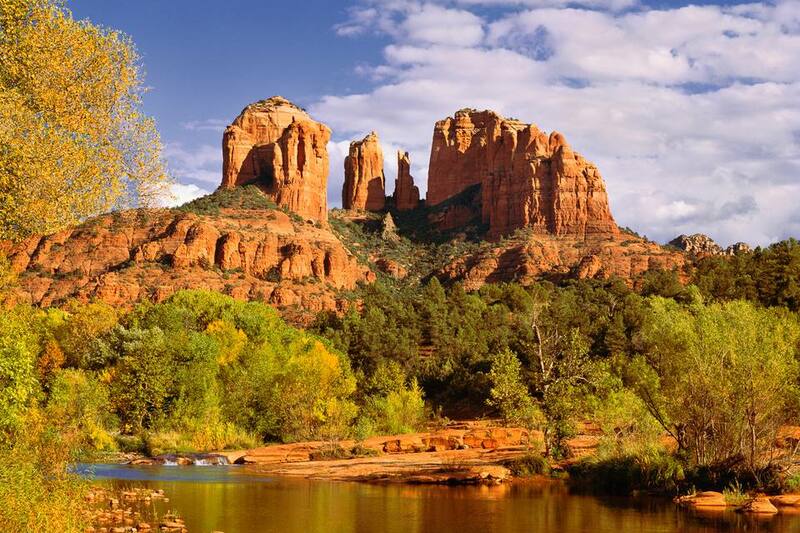 The Sedona Metaphysical Spiritual Association connects spiritual seekers in Sedona to the metaphysical spiritual practitioners and businesses who can best assist them in their journey. As you hike and explore along your spiritual journey, be mindful of the natural beauty and stay safe. Leave the area as you found it so that others who follow you will have the best experience possible. Enter these areas in the spirit of respect for the land, for the history of any artifacts, and for the significance of these areas. Avoid climbing and standing near ledges. The rock is very soft, is often loose and may give way easily so it is best to stay on trails. Take time for quiet reflection. Keep your voice low. Others may be meditating. If you see people vandalizing sites or starting fires, report this to the Coconino National Forest Fire & Vandalism Dispatcher. The 24-hour line is 602-526-0600. Start fires (even light candles) of any kind at the sites. Take home any rocks, rock fragments, pot shards, or natural vegetation. Pick up or move any rock or artifacts at a site. Don't use rocks to make Medicine Wheels. Draw or scratch graffiti on rocks or cliff faces. Also, don't touch petroglyphs. Camp or sleep in ruins, or dig or remove artifacts from a site. Don't leave offerings.